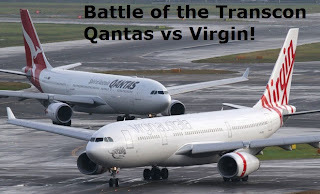 After my recent experiment of flying both Virgin Australia and Qantas in business class on the trans-continental run between Melbourne and Perth I am going to discuss a few of the pros and cons of each. Despite Qantas offering some flights with their international skybeds, the vast majority of services are operated by A330's with recliners with very poor pitch and some have seven abreast seating with a middle seat blocked for extra space. So this one is a very easy win to Virgin who offer either an angled lie flat seat or a very deep reclining international style business class seat with fabulous pitch. Qantas have more options with more daily flights and almost all are A330s. On weekends Virgin has been putting in quite a few B737-800's with much lower standard seating. The overall catering experience with Qantas was better. I much prefer the proper table service with table cloth and each component being placed on the table and not coming on a tray. It's just a classier arrangement. Also, there was more food and more choice. I was disappointed to be offered ONLY a dessert and not both cheese AND dessert on Virgin... on Qantas this was not a problem. I did enjoy the full menu and wine list that came in a large booklet on Virgin, it was far superior to the flimsy piece of paper I was handed on Qantas with no separate wine list. The wines on Qantas I felt were better however Virgin Australia did offer champagne including as a pre departure drink whereas Qantas only offered an Australian sparkling and there was no sign of it during boarding. Virgin is a clear winner in this department. They offered both a basic amenity kit and some decent hand creams in the lavatory (by Grown). Qantas offered no amenity kit and only basic handwash in the toilet. Qantas did however offer cotton towels instead of the paper towels offered by Virgin. I have to say both airlines provided superb service in the air despite the very different crews. Qantas crews were more 'mature' in years but very polished and very friendly. Virgin offer a slightly younger crew and have a slightly more 'fun' attitude but it's by no means over the top. I enjoyed the service on both airlines. The Qantas crew were not as pro active in offering wine topups as the Virgin crew however the Qantas crew had more people to serve as it was a fuller flight. I used both the Virgin Lounge at Melbourne and Qantas Club in Perth. I think Virgin was slightly better in decor and I preferred my barista coffee being served in proper china and not a paper cup. However if Qantas opened a lounge in Perth at the standards of the Qantas business class lounges in Melbourne, Sydney, Brisbane and Canberra then Qantas would win. I am not going to declare a winner here as both airlines have their pros and cons. I think if Qantas upgrade to angled lie flats on the entire domestic A330 fleet then they would be the better choice. Until that time Virgin is very competitive with seating but just needs to slightly lift the game with catering. Both airlines are offering a great service and thanks to the competition between them the clear winner is US.... the passengers! 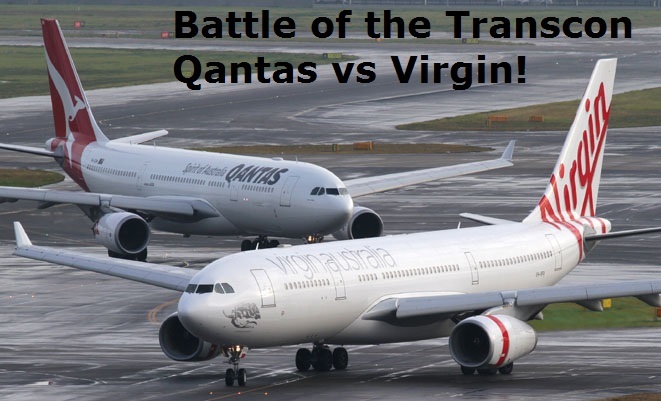 Excellent comparison" I would say qantas is just a bar above and in 2014 when all A330's have flat beds virgin will have no competition. I think you should've compared the entertainment systems of both airlines.